I, James T.S. 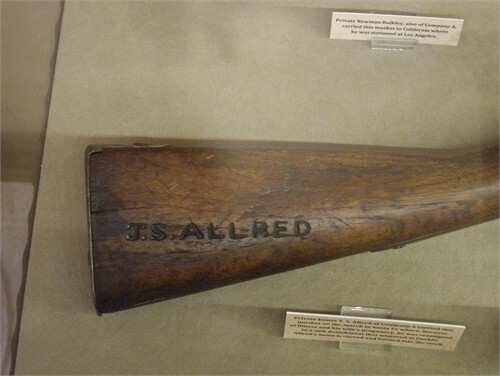 Allred, son of James and Elizabeth Warren Allred, was born in Bedford County Tennessee, March 28, 1825, and at the age of five years removed with my father to the State of Missouri, in Monroe county which was five hundred miles. Here we settled down and in September of 1832, my father and mother were baptized into the Church of Jesus Christ of Latter Day Saints by Elder George M. Hinkley, and I was blessed on the same day, which was Sept. 10, 1832. There were a number of my brothers and sisters baptized on or near the same day, and a large number of my relatives joined the church at the same place. A large branch of the Church was built up at Salt River and was called Salt River Branch. 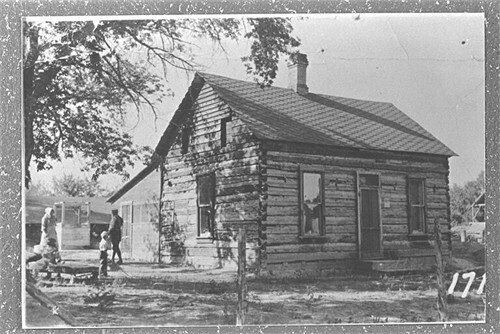 In June 1834, the Prophet Joseph Smith arrived at my father’s house on his journey up the upper part of Missouri with a company of two hundred of the brethren on their journey up the upper part of Missouri in order to redeem Zion as they thought, or to reinstate a portion of the saints who had been driven from their homes in Jackson County Missouri, and the winter of 1835, father’s family, Uncle Isaac and Uncle Wm. family moved up to Clay County, Missouri and in the winter of 1835, I was baptized by Wm. O. Clark and confirmed by Martin C. Allred. In the spring of 1837, father and his family moved in Caldwell County, where the saints began to gather and build up a stake of Zion. The Prophet Joseph Smith also gathered here with his father’s family. In the autumn of 1838, times began to be very troublesome, the citizens of the adjoining county raised all manner of false accusations against the Latter-day Saints and more especially the leaders of the church. So that the Governor of the State ordered out several thousands of men to either exterminate or expel us from the State of Missouri and by laying down our arms and giving up the Prophet Joseph Smith and his brother Hyrum and several others of the heads of the Church and also agreeing to leave the State of Missouri in the spring of 1839, they spared our lives and accordingly in the spring of 1839 the Church members left the State of Missouri and moved into Illinois and most of the relatives went to Illinois too and lived in different parts of the State. Father settled in Pittsfield, Pike County and one of my brothers and sister and brother-in-law settled in the same place. My father’s family consisted of eight sons and four daughters. At this date five of his sons and three daughters were married. The names of family are as follows: Wm Hackly, Martin Carrel, Hannah, Sally, Isaac, Reuben Warren, Willy Pane, Nancy Curry, Eliza Marie, James Tilman Sanford, John Franklin Layfayette, Andrew Jackson. His son-in-laws names are: Andrew Whittack married Hannah, and John Newton Burton married Sally, who died at Salt River, Monroe County, Missouri in the year 1834, Dec 2. She left one daughter Leone. James Gregg married Nancy. Father lived here one summer and in the course of the summer my youngest sister Eliza Marie married George T. Edwards. And in the fall of 1839 he moved to Hancock County, Illinois to a place that was called Commerce and afterwards to Nauvoo. 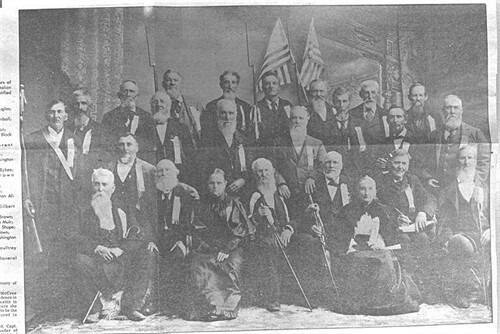 Here the saints began to gather to build up another Stake of Zion and they commenced to build a temple in 1841. My second brother died May 2, 1840 and his wife died in July of the same year, leaving eight children whom my father took and raised. We lived here a short time and prospered fine considering all the difficulties that we had to pass through. In the year of 1842, my younger sister Eliza Marie, died in my father’s house on the 30th of July. Nancy died in the State of Indiana, each leaving two children. I was ordained a Seventy in 1842, and made a member of the fourth Quorum of Seventies at the same time. By this time the saints began to be persecuted very hard, especially the leaders of the church. On June 27, 1844 the Prophet Joseph Smith and his brother Hyrum were murdered in the Carthage Jail, Hancock County Illinois, by a mob of the citizens of Illinois and Missouri. President Brigham Young then took lead of the Church. In connection with the Twelve Apostles, he went building upon the foundation that the Prophet Joseph had laid. Persecution began to rage again with awful fury, and in 1845 the mob commenced burning houses. On November 23, 1845 I was married to an English girl by my father. Her name was Eliza Manwaring. The following winter the saints commenced to prepare to leave the United States and go west into the wilderness. In January 1846, I received my washings and annointings in the Kirkland Temple of the Lord with my wife. February 9, 1846 my father, mother, and two brothers started west with the leaders of the church and others. On the 20th of May, three of my brothers, one brother-in-law, myself and our families started west through the Iowa territory and overtook father at Mt. Pisaga. We traveled together to Council Bluffs. On July 16th I enlisted in the Mormon Battalion and started to Mexico by the way of Fort Leavenworth and from thence to Santa Fe and then to Pueblo on the head of the Arkansas River where I wintered and in the spring we renewed our journey westward and arrived in Great Salt Lake Valley July 29, 1847. My wife and I suffered a great deal on our journey. We were just one week behind the pioneers. Here we started to put in grain and build a fort for our houses. The second year we raised quite a bit of produce more than the first year, but the crickets destroyed a great deal. On February 28, 1848 my first daughter Eliza Maria was born. My wife had three miscarriages before she had any living child on account of the hardships. In the spring of 1849, I went back east to the Platt River to establish a ferry. I was gone on my journey three months. On my return President Brigham Young called me to go to Sanpete Valley to make a new settlement. In November 1849, I left and that winter and the next we had so much snow that it killed most of our cattle. January 13, 1850 my second daughter Ellen Aurelia was born. I settled in the south part of Sanpete County and in the fall of 1850, my father and family arrived in Sanpete from the States. I had not seen them for five years. On Feb. 25, 1850 my oldest sister Hannah died leaving a husband and seven children, and on July 19, 1850 my brother John Franklin Lafayette died leaving a wife and one child living and one dead. He died with the cholera. I remained in Manti, Sanpete County. Until the spring of 1852 when I according to the council of President Brigham Young moved with father sixteen miles north and commenced a new settlement. We remained there until July 29, 1853. I moved to a new place according to the council of President and made a new attempt at settlement. I remained there about two months and then we were called to vacate the place again and go to Manti. We left Dec. 17, 1853 about fifty families most of them Danish people, and among them were my father’s family two brothers and their families, my wife’s brother, Richard Manwaring and wife, my wife’s brother-in-law, Richard Roberts, and her sister Margaret, who had just come from England the last season. She was the first of my wife’s relatives that I saw. My wife had left her relatives in England and gathered in Nauvoo in the year of 1842, for the sake of the gospel. 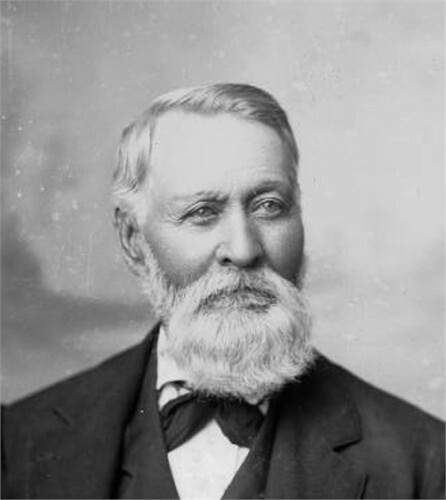 I remained in Manti during the winter of 1853, and then was counseled by President Young to commence a new settlement which was called Ephraim. On the 25th of March 1854, my third daughter, Elizabeth Diantha, was born in Manti and on Feb. 25, 1855, my first son, James Tillman Sanford was born in Manti. We finished our fort wall in March 1854, which was eight feet high (we afterwards raised it to ten feet). I moved my family to Ephraim in April 1855, and at the spring conference I left my home May 8th with a company of U.S. soldiers. I was an Indian interpreter for them along the route. I left them at Little Creek, Beaver Co., because they were so wicked and always cursing the Mormons. While on my mission, I acted as an Indian interpreter for the other missionaries. We worked among the Indians and converted and baptized a large number. I later moved to Spring City where I lived the rest of my life. April 6, 1855 I was called to go on a mission to Las Vegas, New Mexico to preach to the Piute Indians and to teach them the arts and sciences of civilization. I therefore went to Great Salt Lake and was set apart for that mission and was blessed by President Orson Hyde. I worked with hides, tanning them to make harnesses, ships, cinches and other things and was noted for braiding ships and making ropes of hemp and making gloves out of buckskin. I had four wives and father of seventeen children eight boys, nine girls. 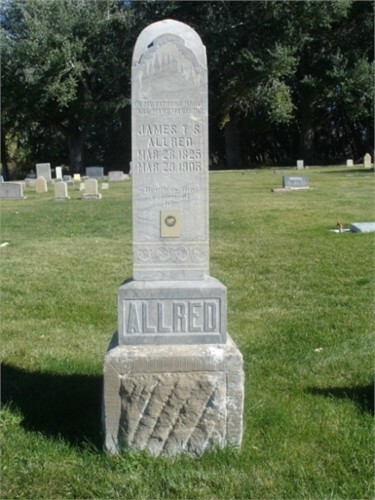 Allred died on his 80th birthday, March 28, 1905, in Spring City, Sanpete Co., Utah.